Under Categories, make sure Java is selected and under Projects: make sure Java Application is selected exactly as is shown. If you have done everything correctly, the Java File opens where you can start writing programs. This is shown below. Step 5: Take some time to observe the parts I labelled 1 – 6 as you can see in the screen below. 2. File Tab – Where you can see two folders. 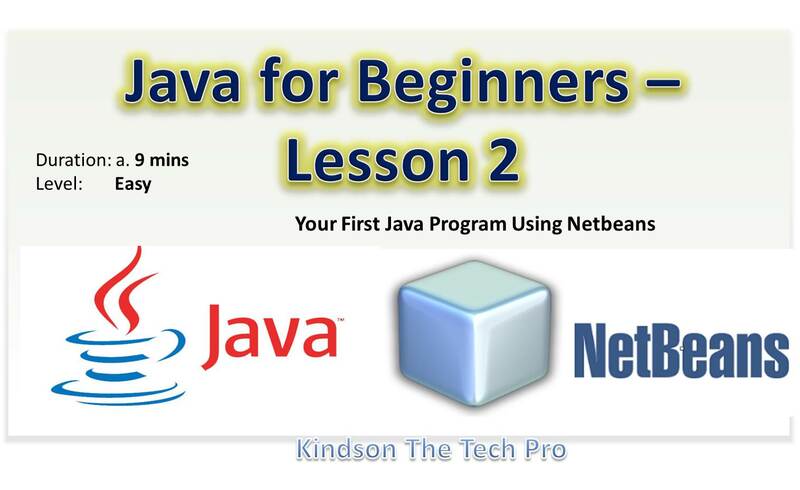 The Second folder is yours, Netbeans keeps all your file in this folder. Later, we would discuss the content. 5. The name of the package. This is same name as the folder name in the Files tab. The package contains all your files. 6. The name of the Function. Every java program must have this Function called main. Now on to Step 6. Step 6: In Section 6 under the part that says //TODO…. Step 7: Run The Program by clicking on the Run button. The Run Button is highlighted in Red. It it a green play button. 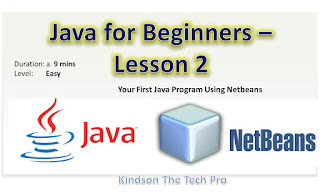 If you have come this far, you have successfully completed Lesson 2 of the Java Programming Tutorials for Beginners. Congratulations! !If you have some issues, let me know in the comment box below, before I publish lesson 3.